In many areas of the world, many people border on malnutrition. In addition, if events such as drought, war or changes in political climate occur, millions suffer from starvation. Although the basic condition of PEM is the same in all parts of the world from whatever cause, malnutrition due to long periods of near-total starvation produces unique clinical appearances in children virtually never seen in the Western World. The term PEM covers all the clinical conditions seen in adults and children; a clinical classification is shown. Marasmus is the childhood form of starvation. Kwashiorkor occurs in a young child displaced from breastfeeding by a new baby and fed a diet with a very low protein content, such as cassava. 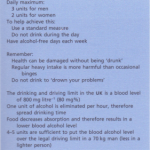 This diet, in which energy is not limiting, results in a high plasma insulin and a low plasma cortisol. This hormonal pattern leads to an uptake of amino acids in the muscle (diverting these from the liver) leading to reduced albumin synthesis and, therefore, oedema (i.e. kwashiorkor). Conversely, when energy is limiting, there is an opposite hormonal pattern (i.e. low insulin and high cortisol). Amino acids are now released from the muscles, albumin is synthesized and this results in marasmus rather than kwashiorkor. This classical hypothesis of protein deficiency with adequate carbohydrates as the aetiology of kwashiorkor is difficult to substantiate as most infants will have deficiency of total calorie intake and also other unspecified nutrients. Alternatively, it has been suggested that kwashiorkor results from an imbalance of free radicals and their safe disposal, causing cell membrane damage and oedema. In addition to the above, infection and diarrhoea with protein loss can affect the clinical picture. Wellcome classification of protein-enerqy malnutrition. cortisol). Amino acids are now released from the muscles, albumin is synthesized and this results in marasmus rather than kwashiorkor. This classical hypothesis of protein deficiency with adequate carbohydrates as the aetiology of kwashiorkor is difficult to substantiate as most infants will have deficiency of total calorie intake and also other unspecified nutrients. Alternatively, it has been suggested that kwashiorkor results from an imbalance of free radicals and their safe disposal, causing cell membrane damage and oedema. In addition to the above, infection and diarrhoea with protein loss can affect the clinical picture. Starvation in adults leads to extreme loss of weight depending upon the severity and duration. They crave for food, complain of cold and weakness with a loss of subcutaneous fat and muscle wasting. In starvation, there is apathy. Infections, i.e. gastrointestinal or bronchopneumonia, are common. 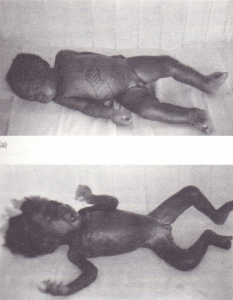 Children under the age of 5 years MARASMUS is the commonest type of severe PEM seen. A child looks emaciated, there is obvious muscle wasting and loss of body fat. There is no oedema. The hair is thin and dry. The child is not so apathetic or anorexic as with kwashiorkor. Diarrhoea is frequently present and signs of infection must be looked for carefully. KWASHIORKOR shows the child to be apathetic and lethargic with severe anorexia. There is generalized oedema with skin pigmentation and thickening. The hair is dry, sparse and may become reddish or yellow in colour. The abdomen is distended due to hepatomegaly and/or ascites. 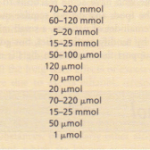 The serum albumin is always low.